Thrive is Honest Kitchen's all life stages diet that contains all natural ingredients like free-range chicken, vegetables, vitamins, minerals and the gluten-free, organic grain Quinoa. A Bolivian grain, Quinoa is easily tolerated by even the most grain-sensitive pups and contains every single amino acid. Thrive’s gluten-free, low carbohydrate profile is ideal for sensitive dogs who need a gluten-free diet but with a little grain, to help maintain a healthy body weight and keep your dog sparkling with health and energy. 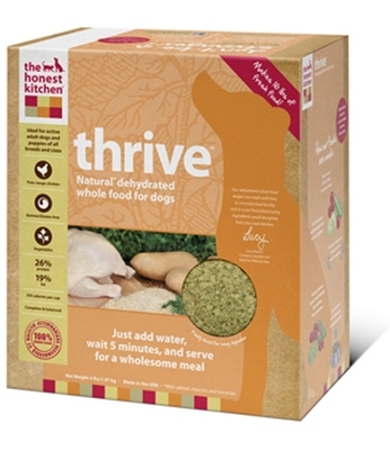 Thrive contains a minimal array of ingredients to accommodate the needs of pups that can't tolerate flax, potatoes, or high glycemic index fruits. Alongside its Vitamins & Minerals, Thrive consists only of: Chicken, Organic Quinoa, Sweet Potatoes, Spinach, Parsley, Kelp, Rosemary. Good for all ages of dogs, including active adults, healthy seniors, puppies and even pregnant or nursing dogs. Free-range chicken, organic fair-trade quinoa, sweet potatoes, spinach, parsley, organic kelp, rosemary, tricalcium phosphate, choline chloride, zinc amino acid chelate, vitamin D3 supplement, vitamin E supplement, potassium iodide, potassium chloride, iron amino acid chelate, copper amino acid chelate. Each cup of Thrive should be rehydrated with 1.25 to 1.5 cups of pure, warm, filtered or tap water, or boiled water that has been allowed to cool. Add the water to the food and stir well. The product will initially resemble soup. Let stand for 10 minutes for the ingredients to rehydrate sufficiently. Add your own ingredients if you wish. 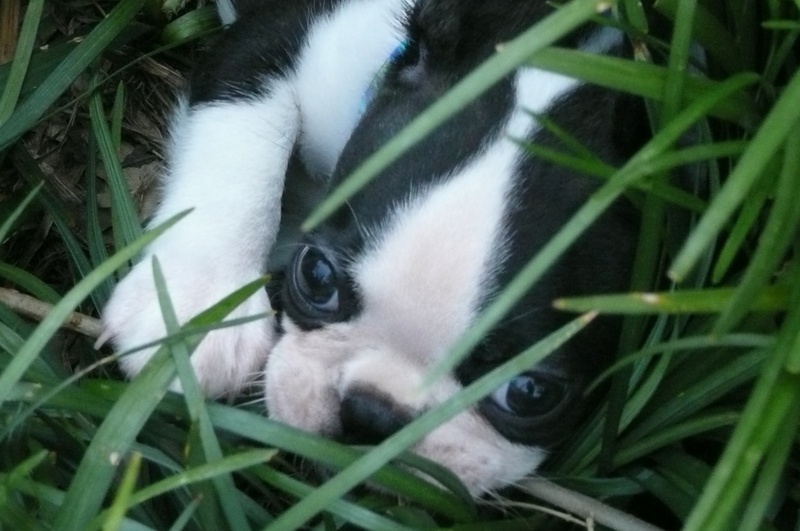 The following suggested dry-measured amounts should be adjusted to suit your own dog's unique nutritional requirements, which will vary according to age, breed, level of activity and what other ingredients are added. Thrive may be fed ad-libitum during growth, gestation or lactation.